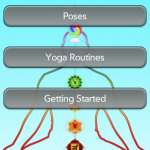 Yoga Pal is a yoga app like no other. 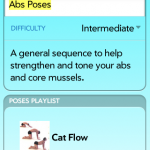 Containing over 100 pose cards, tons of info, and a customizable workout routine playlist, you will have endless ways to enjoy your yoga practice. Each card has directions and pitfalls that will help you learn and improve over time. Poses are preformed by Mark Giubarelli, owner of yogacards.com, a yoga master with over 15 years teaching experience. You can browse one by one, or search by difficulty, type, or area of benefit. Best of all you can use the playlist option to walk you through pre-made sequences of Sun Salutations and many other flows. You can even make your own custom sequences, or modify pre-made ones. You also have the option to add a timer, so you know how long to spend on each pose. A sound chime can also be turned on to alert you it has advanced to the next pose. The screen will also stay on while you are looking at poses, or are in a workout, so you do not have to worry about fiddling with the screen, letting you focus on your breath. The program includes a Getting started page with a few general pointers and facts, that I will keep expanding with future updates. Yoga is one of the best ways to exercise, and improve your fitness and health. It is a great way to improve focus, help with depression, and generally make you happy and full of energy. The goal of this app is to bring those benefits to you with ease and enjoyment. As always if you have any problems, bugs, or feature requests please EMAIL us and let us know. Over 100 poses to view, sort, search! A yoga card, with the timer going. Edit and create new work out playlists! Just a few of the included work out/practice routines.